Redstar played my mashup/bootleg of Earthscape vs. Armin van Buuren “Believe Me In The Rain” [Martin Müller Mashup] in his radioshow Aura Sessions 131. It was the 8th track of the show. If you want to check out the replay of this episode, you have to go HERE. Thanks again Steve for the support! What are your favorites of Tic Tac Trance #016? 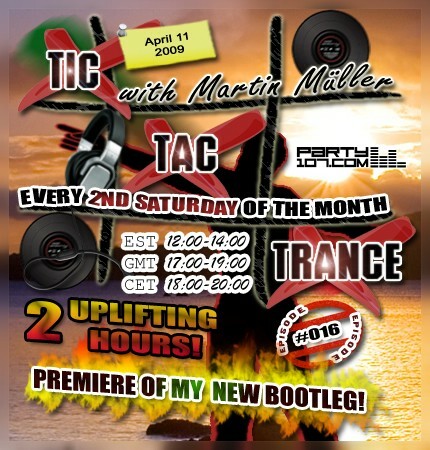 The next show of Tic Tac Trance #016 will be broadcasted on Saturday, April 11. As always, this show will feature my current favorite tunes in progressive and uplifting style from labels like Vandit, Enhanced Recordings, Anjunabeats, Discover, Flashover Recordings and many more. This time I will also reveal for the first time a new bootleg that I’ve worked on for severals days. You can’t believe how curious I’m about the reactions of it. The webvote will be back again, so you’ll be able to vote for up to 3 of your favorite tunes of this show. See you next Saturday! My show starts on April 11 at 18 CET / 17 GMT / 12 EST. Check out your local time HERE! I worked several days on a new mashup which will air exclusively on April 11 in my next episode of Tic Tac Trance. You can expect a very uplifting, melodic tune from a rising producer mashed up with a very popular vocal track from a very popular DJ and producer. Beside that I sent my mashup out to a few producers and DJs, that I trust, to get some feedback.